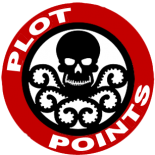 There’s been a lot going on behind the scenes here at Marvel Plot Points as we’ve been trying to assess the future. We bit off a bit more than we can chew by attempting to do AvX. However, we’ve developed a lot of material you can use to run the game. Starting Sunday, we’ll begin sharing that material every day for the next week. We’re very excited by what we’re going to show you. We’ve also prepared more datafiles and milestones for posts coming soon. We can’t promise regular updates, but we’ll try. We’ve also decided to move away from trying to work on large-scale events. Other than Secret War, any other event we’ve run here on the site has been sent to us completed, or written by one of our writers and then submitted to us. We’re also happy to take submissions from our readers for datafiles or events. I’m looking forward to this brand-new phase of Marvel Plot Points, and I look forward to your feedback. I’m not nearly as concerned about events as I am datafiles, the lack of being the major downfall of Marvel Heroic. I still run TSR’s Marvel Super Heroes regularly and the sheer number of characters at my disposal is a big part of why I don’t do Heroic on a regular basis. I really wish MWP had put out a big book of just datafiles to work with before the ship sank. This site has been a great resource, though. Thanks to everyone involved for your continued support of the game! AvX read like it was made for MHRP. (Little girl squeal!!) I can’t wait! I also agree with Bl00dwerk, having more datafiles, milestones, and other stuff over events would be great, I’m working on a large-scale project for a custom world so events won’t be the same anyway, they are great examples however and I have all the ones you have posted. You guys have done excellent work and have nothing to apologize for. Keep doing what you guys do! Have a couple of Datafiles I’ve worked on for characters that were in AvX(Captain Britain, Valkyrie + milestones for Novah/Protector)[plus quite a few others], but they’re only text files not pdf’s or jpg’s formatted like regular datafiles so didn’t submit them. Are you ok with submissions in txt/rtf/doc format? Go ahead and shoot them to us. If we get them in time, we’ll credit you with them, and share them as part of the AvX posts here. This entry was posted on September 8, 2016 by Mark in Feedback, Preview.